On behalf of all of the members of Our Woodworking League of greater New Orleans, may I express our sincere appreciation to you and your company for the generous gift of promotional materials forwarded for our October 13th meeting. We had an attendance of approximately 20 persons at the new workshop of one of our young members, Mr. Mark Haun of Metairie, LA. 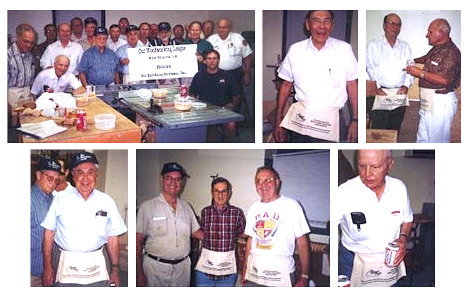 As you can see from the attached photographs your aprons and catalogs were received with great enthusiasm by those in attendance. We also appreciate the dust system calculators, which can and will certainly take some of the mystery out of properly sizing a home shop dust collection system. I’ve included a list of our current membership roster, which included only two persons who earn a living by working wood. The rest of us are learning to enhance our skills in this best of all hobbies and a wonderful outlet for our creative energy. This group includes retired engineers, business executives, attorneys, a dentist, a local fire chief, a host of World War II fighter pilots, Purple Heart winners, marines on Iwo Jima, a retired sea captain of merchant vessels. We even have a DNA scientist Ph.D. in the group who loves to turn wooden bowls for therapy. Again, our sincere thanks to Air Handling Systems for your interest in our club and we hope to keep in touch through the magic of the Internet at www.airhand.com.